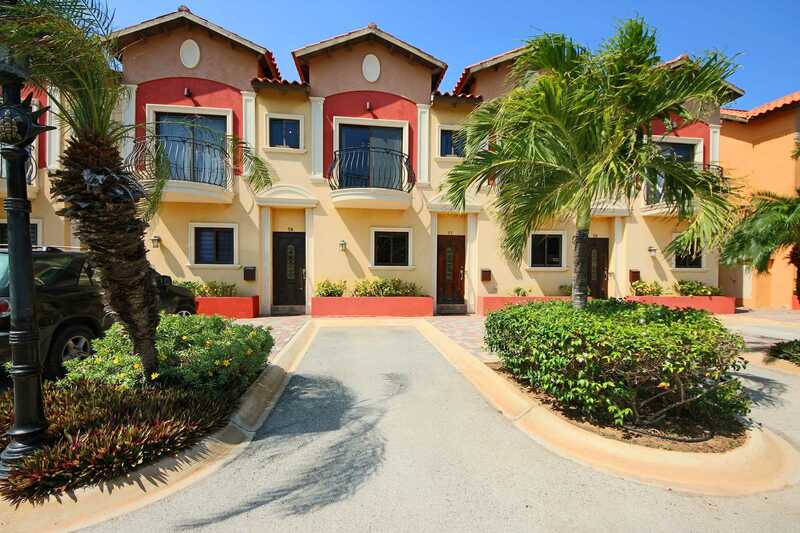 The Tropical Birds Two-bedroom townhome is a 2-story floor plan vacation rental in the gated and upscale residential community of Gold Coast Aruba. This townhome has downstairs an open plan living area with a fully equipped open kitchen with 2-bar seats, a 6-seat dining table, a queen-size sofa bed, a TV, a full bathroom and access to the fenced patio with 4-seat dining table and BBQ-grill. Both bedrooms with en-suite bathrooms are located upstairs. The master bedroom has a king-size bed, TV, build-in closet, balcony and en-suite master bathroom with shower. The second bedroom has a queen-size bed, TV, built-in closets, balcony and en-suite bathroom with also a shower. Air Conditioning in all bedrooms and living area, a private parking space, hot water, free wireless internet, three flat-screen TV (in the living room and each bedroom), in-room washer/dryer facilities are all available for your extra comfort. 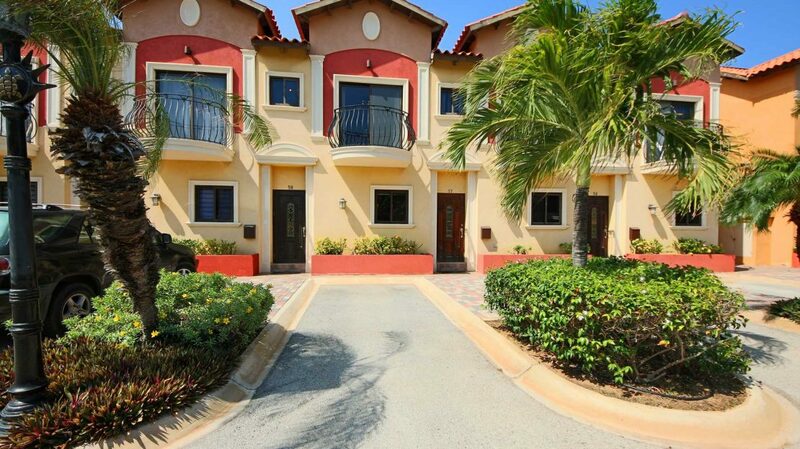 This townhome offers you 1450 sq ft of vacation pleasure and is just a few steps from the small communal swimming pool area of Gold Coast Aruba! – Sleeps max 4+2. The Gold Coast Aruba is among the most upscale private residential resorts on the island of Aruba, providing you with its one-of-a-kind residential resort experiences! Situated close to the exclusive Malmok area of Aruba, this residential resort features condos, townhouses and villas of deluxe quality on the “One Happy Island”. A vacationing destination with a touch of local residential flavor, makes it unique of its kind in the entire Caribbean! The clubhouse of Gold Coast Aruba features the best culinary journey in Aruba, White Modern Cuisine. A restaurant with bar, where you can enjoy the harmony between food and wine. Where quality and flavor are brought to you in its purest form. An International Fine Dining experience serving Breakfast, Lunch and Dinner. The clubhouse also has a gym (available only for Gold Coast guests), a luscious large swimming pool – over-looking the Malmok and high-rise hotel areas – and two tennis courts. Also within this community there is a large and a small communal swimming pool areas for use by all guests with palapas and lounge chairs. Furthermore, both communal pool areas have an outdoor kitchen with large BBQ-grills; free reservation and a cleaning fee is applicable for use of a communal BBQ-grill, whereas many units have their own private BBQ-grill. Several exquisite beaches, like the Malmok Beach, Boca Catalina Beach and the Arashi Beach are just a few minutes away. The world-famous Palm Beach, less than 10 minutes’ drive away, offers plenty of water sports companies, piers, beach bars, restaurants, entertainment, casinos and shops. Two of the largest shopping malls in Aruba, Palm Beach Plaza Mall and Paseo Herencia, cater to the shopping fever and offer various good restaurants, cinema theaters, water fountain shows, game rooms, bowling, arcade games and Spa facilities. At night this area comes to life as the many lively nightclubs, cafe, bars and restaurant give an upbeat entertainment experience. Palm Beach, also known as the high-rise area, is a tourism district about 4-miles northwest of Oranjestad, the capital of Aruba. Several other popular beaches, like the Eagle Beach and Hadicurari Beach, are just a few minutes’ drive away too. A rental car is necessary and our resort’s concierge will be more than happy to assist you in reserving one.